Radio shuttles are unique autonomous devices used for loading and unloading stock units and can be transported throughout the warehouse by shuttle cars or stacker cranes or also work directly with forklifts. Solutions which utilize a shuttle car on each level may be appropriate for facilities up to 65 feet high. However, from that height and upward our experts must analyze and solve the bottlenecks that can come about if the right number of vertical reciprocating conveyors aren’t installed or assigned optimally. Operators perform much less effectively when exposed to extremely cold temperatures for extended periods of time. These types of systems are specifically designed to effectively use available surface space and minimize leakage of cold in order to increase energy savings. The use of stacker cranes allows for cold facilities to be built to over 130 feet in height. Warehouse management systems allow for inventory to be constantly monitored, thereby ensuring the safety and quality of your temperature sensitive goods. What exactly does the radio shuttle have to offer? Radio shuttles are optimal for cold storage facilities with a low volume of SKUs, but with a large number of pallets and high throughput. When installing this type of solution, it is essential to take into account the ratio of cycles and available storage space. For example, deeper lanes have a greater storage capacity, but fewer cycles can be completed in a given period of time. Although both semi-automatic and fully-automatic shuttles have similar features, depending on the specific characteristics and throughput of your distribution center, one may be better suited for your needs than the other. Shuttles transport pallets within storage channels and work directly with forklifts controlled by operators. A total of 18 shuttles can be controlled remotely by a WiFi connected tablet. Their design includes an electromagnetic locking system at the base of the carriage which ensures for optimal attachment to forklifts and safe handling of goods. Shuttles run on lithium batteries which can operate uninterrupted during 10 hour periods and can be easily and safely replaced when needed. Shuttles transport pallets within storage channels and work directly with shuttle cars or stacker cranes. Because they are compatible to function with stacker cranes, aisle widths can be significantly reduced with this system. Complete system is controlled by WMS software which determines the ideal location for each pallet and minimizes empty storage spaces. Shuttle battery automatically charges when unit is docked with a shuttle car or stacker crane. Compatible with FIFO and LIFO systems. Radio shuttles can be programmed to compact goods at either the front or the rear of a storage lane. Shuttles are able to count pallets and provide real-time inventory control. Operators have complete control and can easily cancel orders or make emergency pauses. 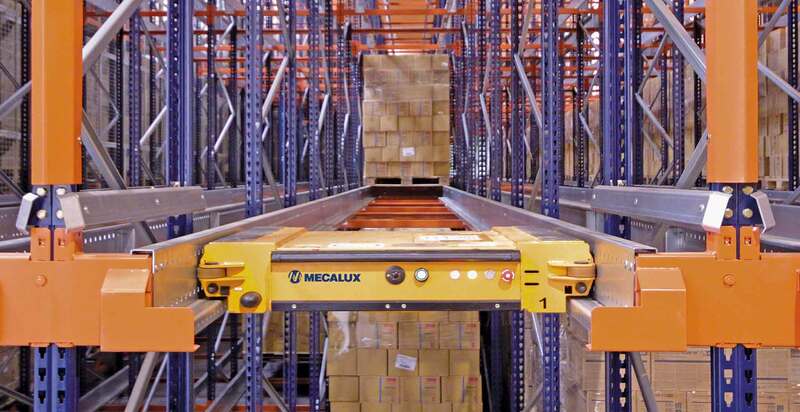 Depending on the type of system, shuttles can be equipped with safety bumpers, location sensors, emergency stop buttons and positioning cameras which allow operators to ensure the correct alignment between shuttles, channels and the pallets of interest. Burro De Paoli, a successful Italian butter production business, is beyond familiar with the incredible benefits the Mecalux radio shuttle system has to offer for their cold storage facility. Their Production and Logistics Manager explains how this innovative system “has let us use all the space in our cold storage chambers” and that they have “streamlined the storage of goods by not having to drive into the warehouse lanes with a forklift”. With the installation of high-tech radio shuttle machinery, this prosperous cold storage facility has maximized its use of space, optimized warehouse operations and is now able to more efficiently manage its precious home-style butter products. Both semi-automatic and fully-automatic radio shuttles are ideal for any warehouse with a high level of loading and unloading activity and that is looking for a solution to optimize safety, control, performance and storage capacity. However, when installed in a cold storage facility, the unique characteristics of this system and the benefits that it has to offer increase exponentially. Watch our radio shuttle video to see an example of how semi-automatic shuttles work and to learn more about this revolutionary system.